Whim Biscuit: Victorious Festival 2015. From Southsea sunshine, to Waterloo Sunset, Victorious Festival 2015 is set to be the biggest, most amazing event to hit the beautiful shores of Southsea this year. 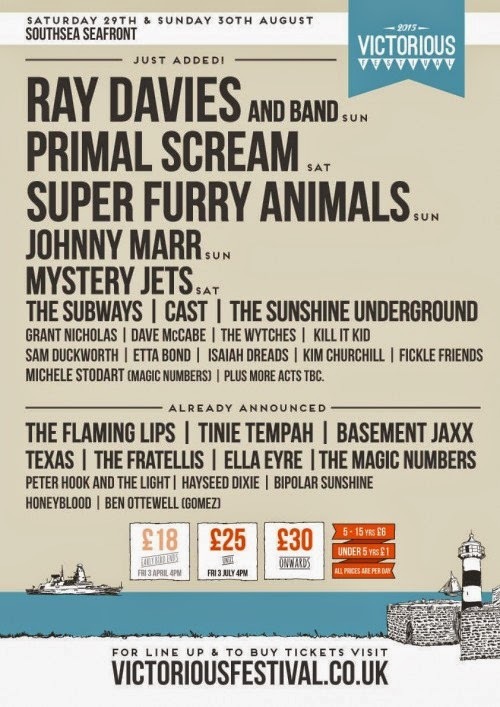 With The Kinks legend Ray Davies, Smiths former guitarist Johnny Marr, Primal Scream and Super Furry Animals being added to the already amazing line up, it only goes to show that the organisers have really worked hard to create a jaw dropping and diverse festival. Easily competing with some of the biggest festivals around. Boasting seven stages, including the new Common Stage, a real ale festival, boutique gardens & market, kids arena, as well as entrance to a number of Southsea attractions, you may be fooled in thinking that you will be breaking the bank to attend. Yet, that is the best bit- tickets per person, per day are only £25! (until 3rd July and £30 after). Where else could you have all of this fun, and see some of the most iconic musicians about for such a low price? Grab your tickets now before they sell out. We predict it won’t take long.